The ECDC Communicable Disease Threats Report (CDTR) is a weekly bulletin for epidemiologists and health professionals on active public health threats. This issue covers the period from 28 October-3 November 2018 and includes updates on West Nile virus, Ebola virus disease and influenza. Screenshot of the interactive content as of 25 Oct 2018. Poliomyelitis, also known as polio or infantile paralysis, is a vaccine-preventable systemic viral infection. Historically, it has been a major cause of mortality, acute paralysis and lifelong disabilities but large scale immunisation programmes have eliminated polio from most areas of the world. The disease is now confined to a few endemic areas and global eradication of the wild polio virus (WPV) is being attempted. The last WPV infection in Europe was in 1998, and the World Health Organisation declared the European Region polio-free since 2002. The ECDC Communicable Disease Threats Report (CDTR) is a weekly bulletin for epidemiologists and health professionals on active public health threats. This issue covers the period 1-7 April 2018 and includes updates on avian influenza, dengue, poliomyelitis, seasonal influenza, MERS-CoV, and yellow fever. 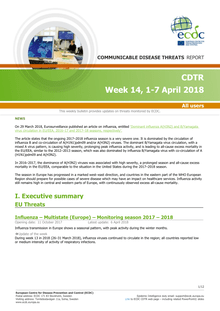 The ECDC Communicable Disease Threats Report (CDTR) is a weekly bulletin for epidemiologists and health professionals on active public health threats. This issue covers the period 10-16 December 2017 and includes updates on diphtheria, influenza, Salmonella and cholera. ​The ECDC Communicable Disease Threats Report (CDTR) is a weekly bulletin for epidemiologists and health professionals on active public health threats. This issue covers the period 12-18 March 2017 and includes updates on cholera, measles and Legionnaires disease. ​The ECDC Communicable Disease Threats Report (CDTR) is a weekly bulletin for epidemiologists and health professionals on active public health threats. This issue covers the period 8-14 January 2016 and includes updates on Legionnaires' disease, Zika virus and seasonal influenza. ​The ECDC Communicable Disease Threats Report (CDTR) is a weekly bulletin for epidemiologists and health professionals about active public health threats. This issue covers the period 25-31 December 2016 and includes updates on polio, influenza A(H7N9) in China and Zika virus. The ECDC Communicable Disease Threats Report (CDTR) is a weekly bulletin for epidemiologists and health professionals on active public health threats. This issue covers the period 11-17 December 2016 and includes updates on Zika virus and influenza. The ECDC Communicable Disease Threats Report (CDTR) is a weekly bulletin for epidemiologists and health professionals on active public health threats. This issue covers the period 30 Oct–5 Nov 2016 and includes updates on influenza, poliomyelitis, Zika fever, MERS CoV, cholera, West Nile virus, and enterovirus detections in Europe. ​The ECDC Communicable Disease Threats Report (CDTR) is a weekly bulletin for epidemiologists and health professionals on active public health threats. This issue covers the period 16-22 October 2016 and includes updates on Zika virus, Salmonella and extremely drug-resistant TB. The ECDC Communicable Disease Threats Report (CDTR) is a weekly bulletin for epidemiologists and health professionals on active public health threats. This issue covers the period 9-15 October 2016 and includes updates on Zika virus, West Nile fever and MERS. The ECDC Communicable Disease Threats Report (CDTR) is a weekly bulletin for epidemiologists and health professionals on active public health threats. This issue covers the period 18-24 September 2016 and includes updates on Zika virus, West Nile fever and MERS.